Epanalepsis is a side-scrolling adventure game that tells the story of three characters in different time periods. Meaning “a repetition of a word or a phrase with intervening words setting off the repetition, sometimes occurring with a phrase used both at the beginning and end of a sentence”, Epanalepsis uses repeating imagery and ideas to tie its characters and time periods together. Divided into three chapters, the game can be finished in under an hour but demands multiple playthroughs to make sense of the abrupt, often confusing endings. Chapter one follows Rachel, a twenty-something in 1993 who would rather mooch off of her friends than get a job; chapter two follows Anthony, an identity thief and conformist in the year 2013; chapter three takes place in 2033, following a robot in charge of monitoring a group of people in cryo sleep and managing their levels of satisfaction. Tying it all together is a duo of time travelers that visit each of them, giving cryptic advice and offering a choice. Since each chapter takes place on the same unspecified city street, each story has a distinct feel. The street of 1993 is all boarded up storefronts, accurately reflecting the recession of the early nineties. 2013 is all cell phone and tablet stores, and 2033 is a dystopian police state with citizens being held at gunpoint. Although the setting is well executed, the story itself is vague and left entirely up to interpretation. The actual gameplay is nothing more complicated than moving left or right and clicking on an object or person to interact with it. There is no puzzle solving or platforming, just pure straightforward storytelling. Despite its sparse gameplay elements and looking outdated with its 8-bit design, the story is interesting enough to play through to the end, and again to try different story paths. Where Epanalepsis really shines though, is with the soundtrack. Featuring haunting synths and comforting guitar work, it fits the setting perfectly. Familiar and soothing during scenes where the characters are at home, then sparse and alien when they face something unexplainable. 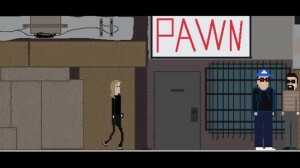 The music is what elevates the game from “ambiguous point and click” to “worth checking out”. Whereas most “space disaster” games feature scary aliens, action, and explosions, Alone with You features realistic human tragedy. It is a unique approach to this genre of fiction that I have never experienced in video games. It is for this reason that this game can still be considered an overall success, despite its overly simplistic and deeply flawed gameplay. Unless you are looking for something to speedrun or desperately want a roguelike you can enjoy in bite sized increments, I can’t recommend The Weaponographist. Montague’s Mount is incomplete, this being part one of a two-part interactive story. If the experience I had will be the same in part two, I see no reason to put myself through the trouble. The design is clunky and for being billed as a horror game, there’s really nothing scary or unsettling about it. There are games that have done a much better job at accomplishing drama through first person and puzzles. Montague’s Mount really tries to aspire to their level only to fall quite short. Primordia definitely has some caveats when it comes to storytelling and pace but the story is interesting enough to warrant a play through. The world you inhabit as Horatio is dark and beautiful and the voice work is topnotch. Characters have a lot to say and it's all worth hearing, and the puzzles will keep you intrigued as the story moves forward.